The code can be compiled and runs on the Android device. Is it possible to 'tell' ReSharper that this is correct? possible to 'tell' ReSharper that this is correct? Thanks for the feedback. It is not good behavior. I'll try to reproduce 'resolve' errors on my machine. If you have any simple demo solution please send it to us for investigation. Thanks in advance! We have fixed issue with MonoDroid. But, unfortunately the nightly page has the pretty old nightly build (it depends on our dev process). We will try to update it ASAP. I now seem to have similar issue. 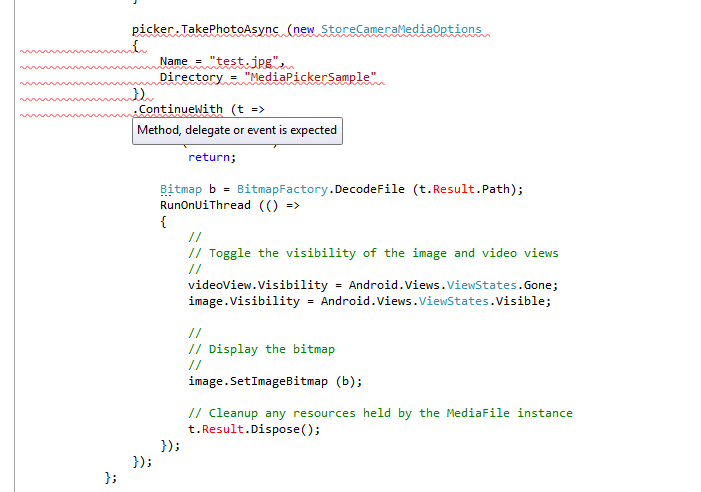 Resharper gets confused with Task.ContinueWith() when using Mono for Android. MainActivity.cs, under MediaPicker sample goes all red in R# (see screenshot), even though it compiles and runs just fine. I am using R# 6.1.1000.82, VS2010, Mono for Android version is couple of weeks old.